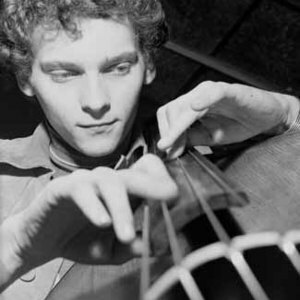 Miroslav Ladislav Vitous (surname originally Vitou?, born 6 December 1947) is a Czech jazz bassist who was born in Prague. He began the violin at age six, and started playing the piano at age ten, and bass at fourteen. As a young man in Europe, Vitou? was a competitive swimmer. One of his early music groups was the Junior Trio with his brother Alan on drums and fellow Czech luminary-to-be Jan Hammer on keyboards. He studied music at the Prague Conservatory (under F.
Posta), subsequently winning an international music contest in Vienna, earning him a scholarship to the Berklee College of Music in Boston. Vitous' virtuoso jazz bass playing has led critics to place him in the same league as Scott LaFaro, Dave Holland, Niels-Henning ?rsted Pedersen and Christian McBride. A representative example of Vitous's double bass playing is Now He Sings, Now He Sobs (1968), with Chick Corea on piano and Roy Haynes on drums. This album shows his strong rhythmic sense, innovative walking lines, and intensity and abandon as an improviser. His first album as a leader, Infinite Search, re-released with minor changes as Mountain In The Clouds featured several key figures from the then-budding jazz fusion movement: John McLaughlin, Herbie Hancock, Jack DeJohnette, and (slightly) elder statesman Joe Henderson. A founding member of the group Weather Report, he has worked with Jan Hammer, Freddie Hubbard, Miles Davis, Chick Corea, Wayne Shorter, Joe Zawinul, and Jan Garbarek. Vitous has since discussed his contentious departure from Weather Report with journalists, specifically regarding his relationship with Zawinul. Alphonso Johnson, who replaced Vitous, was himself replaced by the highly innovative and influential bassist Jaco Pastorius. In 1988 Vitous moved back to Europe to focus on composing, but nonetheless continued to perform in festivals.